The overnight snowfall was still evident as Pissarro set up his easel on the side of the road. Just to the right of the two-wheeled cart, we can easily see the corner of the street where Pissarro lived. The people of the village are busy with their daily errands as a woman sweeps snow off the sidewalk. Pissarro gives us an accurate sense of the gentle downward slope of the road with the decreasing levels of the rooftops. Even though the dominant colors of the painting are warm pinks and mauves, the cold crispness of the air suggested by the white snow on the roofs is intense. This scene has hardly changed at all since Pissarro painted it. The pink building now has three stories, but the smaller buildings on that side are still the same and the tall angled roof is still there although it does not seem nearly as high as he portrayed it. *PDR refers to the number assigned to this painting in Pissarro:Critical Catalogue by Joachim Pissarro and Claire Durand-Ruel Shollaerts (2005). One of Pissarro’s most intriguing paintings, Chestnut Trees at Louveciennes, (1872, Paris, Musée d’Orsay, PDR 218*) appears somewhat ordinary on first glance. 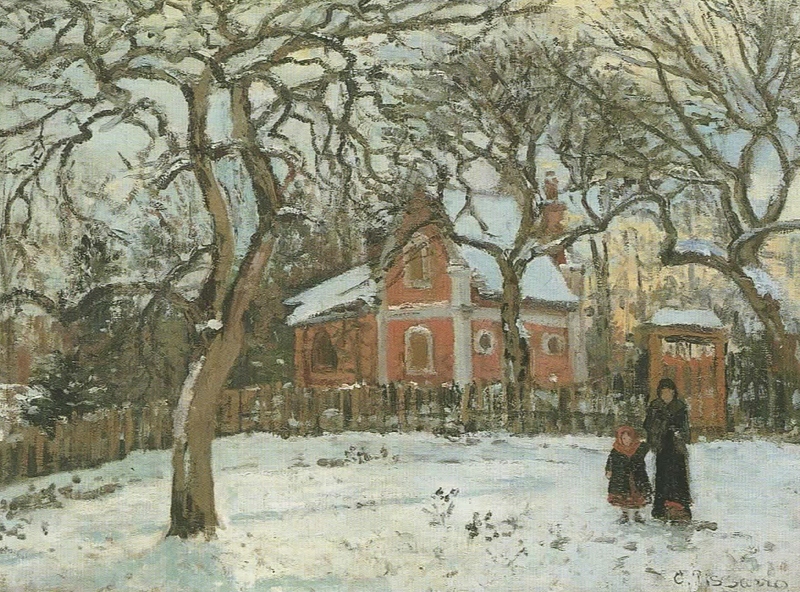 Unlike most of Pissarro’s paintings, this one has a distinct focal point, a large red brick house right in the center. The painting gets its name from the curvy chestnut trees that provide a frame around the house. Indeed, the two trees on the right side appear to be joined together in the arching branches. It is only with a closer look that we determine that the two branches have their own extensions and are not grown together. The bright winter sun glints pale yellow on the snow-covered ground causing the trees and fence to cast blue shadows across the foreground. The woman and child may be Julie, Pissarro’s wife and their daughter Minette, who would have been six at the time. But we are unable to see their faces clearly. The choice of motif is interesting in that this house in Louveciennes looks more like the large Victorian houses Pissarro painted in London. The house has mysteries of its own, which are less visible in photographs but quite obvious on the original canvas. In the area above the little girl’s head and beneath the interlocking tree branches, there is a yellowish-pink color that is totally different from the blue sky and white clouds above. In the space between the white pillar at the back of the house and the little building to the right, we see two dark spots surrounded by a white area. These spots seem similar in size and shape to the small windows on the side of the house. Between the house and the little building are several sketchy marks that suggest the framework of another house, or perhaps an extension between the two buildings—a ghostly apparition. *PDR refers to the number of this painting in the Pissarro Critical Catalogue by Joachim Pissarro and Claire Durand-Ruel Snoellerts, published in 2005. He painted the place that time forgot. See the FB page: PISSARRO’S PLACE.